The best way to battle spam within your email is to mark it as such. This is pretty simple in Google Mail. Simple click the box next to the spam mail and then click the Spam button. This is helpful as others may also be getting the same mail and that address will be added to the Spam filter. Here is a screen shot. 2. 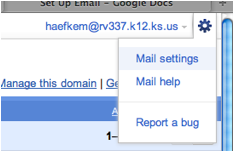 In the upper-right corner of the Mail window, click Settings. 3. On the General page, in the Signature section, enter your signature in the box. 4. Optionally use the options to format the text and add links and images. Note: You can set up only one signature.